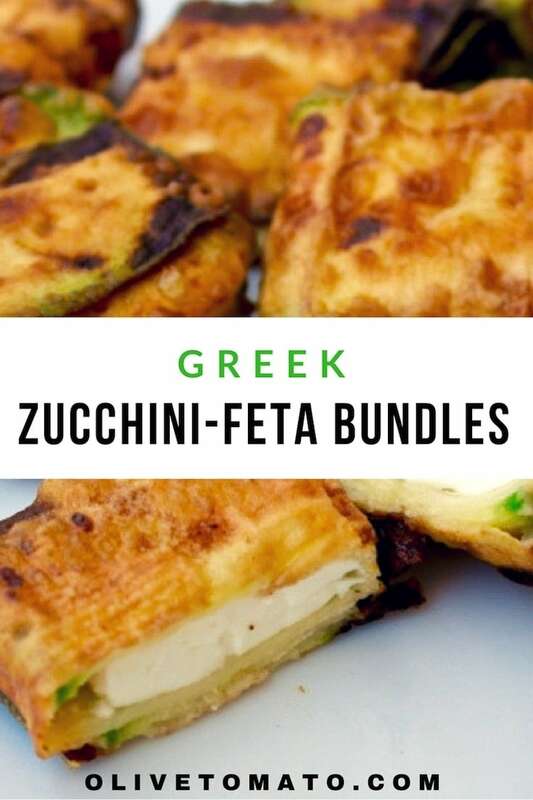 Greeks love zucchini and an all-time favorite when it comes to summer appetizers, are the zucchini fritters or just plain fried zucchini. The fritters are usually a combination of grated zucchini, onions, herbs and sometimes cheese (you can see my baked muffin version here), and it requires a bit of prep, so when I came across a French video showing an interesting technique with zucchini fritters, I simplified it (you only dip it in some flour), made it a bit more Greek using feta instead of mozzarella and they were amazing. 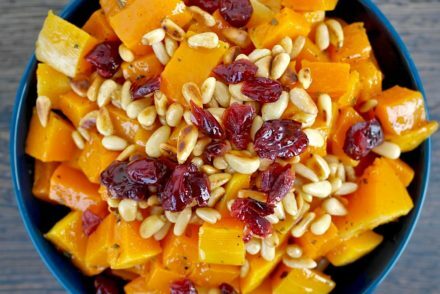 Basically you slice a zucchini in very thin slices lengthwise using a mandolin or a vegetable peeler. This is the only somewhat difficult step in this recipe, you need to have thin slices that are flexible and bendy, otherwise the recipe won’t work. Once you have the slices, you need 2 slices for each fritter and place them on your work surface like a cross and place a small piece of feta in the center. 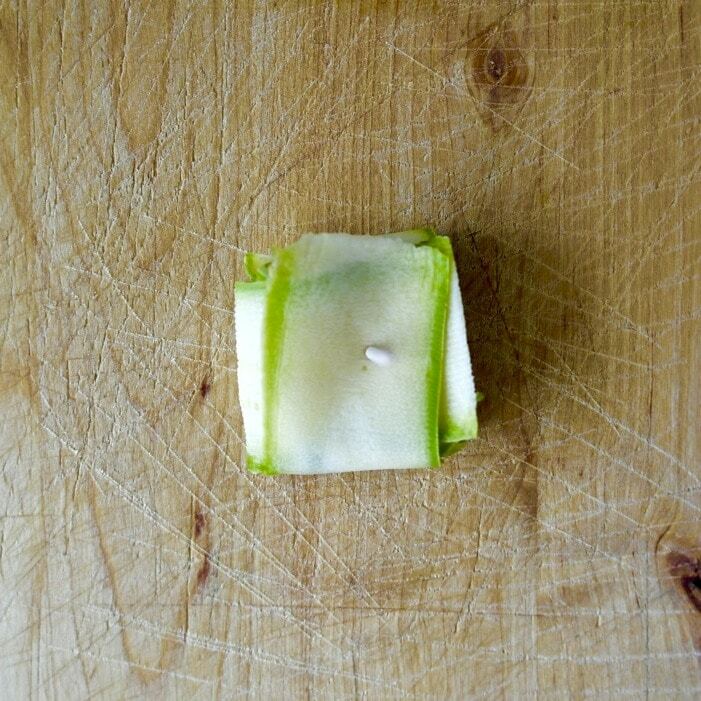 Fold over (starting from the bottom slice) alternating each zucchini slice. Yes, these are lightly fried, not deep fried, but absorb very little oil. 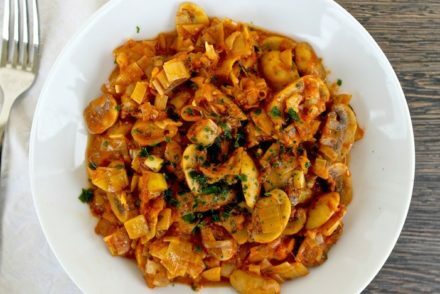 Make sure the olive oil is hot otherwise the zucchini will absorb more oil and become soggy. The result is a bit of crunch on the outside and soft on the inside. 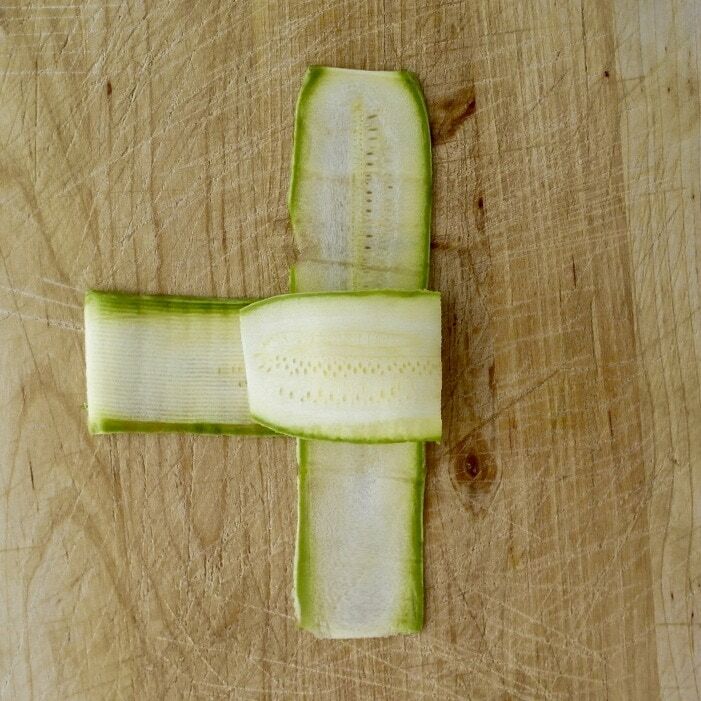 Slice the zucchini in strips lengthwise with a mandolin. 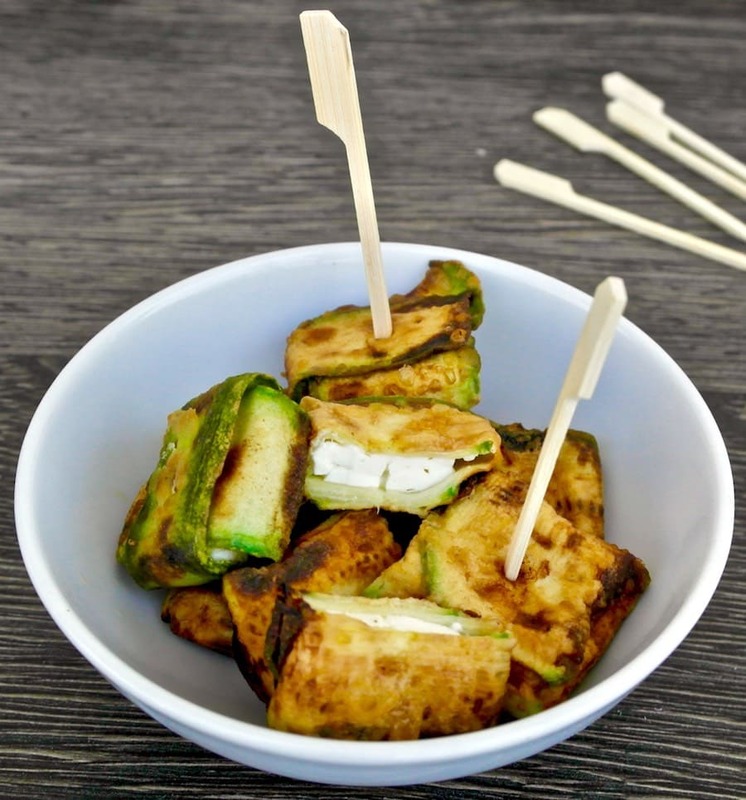 Place zucchini slices in a strainer and salt and let them sit for 30 minutes. 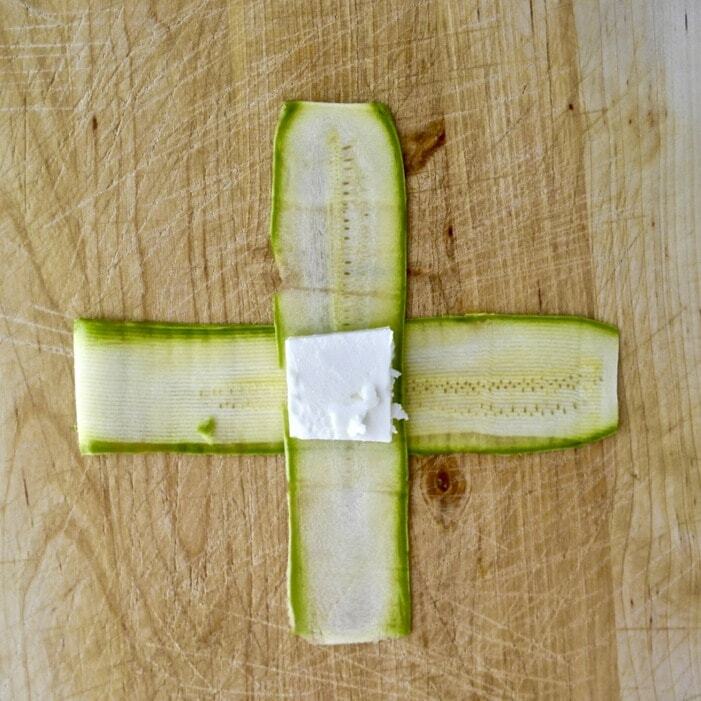 Place the strips of zucchini in the shape of a cross and place a cube of feta in the middle. Fold over starting with the bottom slice, alternating the strips, until it is all folded. Secure with a toothpick (do not let toothpick come out on the other side too much). Dip fritter in egg and then in the flour - dusting off the extra flour and set aside. 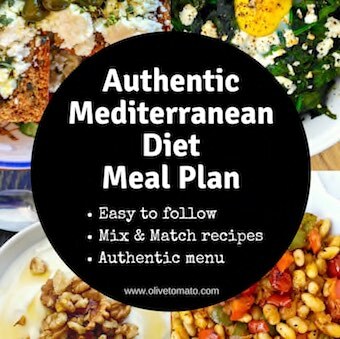 Pour olive oil in a pan about ¼ inch deep, heat the olive oil at high heat. 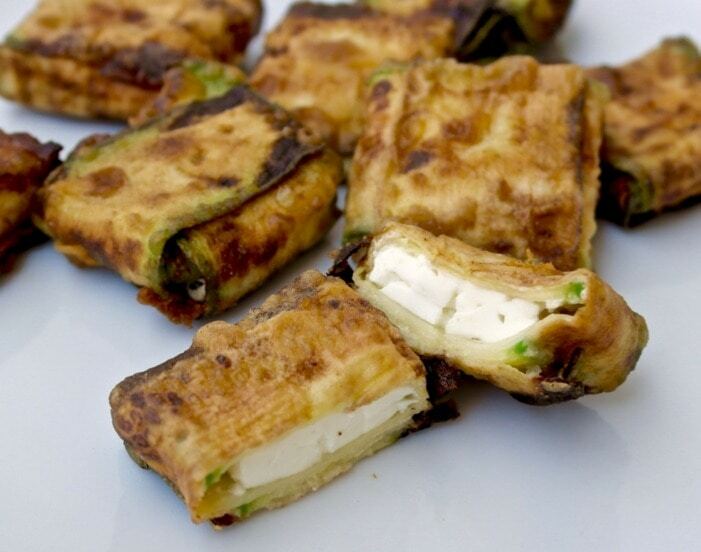 Place the zucchini bundles with the toothpick in the pan and let them fry for about 1-2 minutes. Remove the toothpick carefully, while in the pan and turn the bundles over and fry for another 1- 2 minutes. Remove zucchini fritters from pan and place on a plate with a couple of paper towels to absorb the oil. Merci bien pour le vidéo! I think one could use any white goat’s or ewe’s milk cheese. I’m glad there is no bacon! 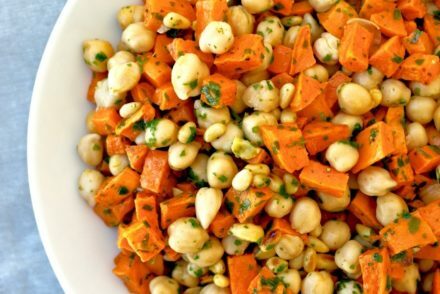 Do you think these could be baked, brushing them lightly with olive oil? But you are right, if it is properly done they shouldn’t absorb too much oil. It may work, just not sure how crispy they will be. Great idea! I’ll try this some day! I love zucchini! I’m going to try these soon! What would you suggest serving these with? Hi Vanessa, either as an appetizer or if it is a meal I would serve it with salad with leafy greens.